Yesterday, a group of 30+ supporters of paid sick days gathered outside the Starbucks on 4th and Cherry in downtown Seattle to highlight the need for paid sick days – especially for workers in the food service industry. 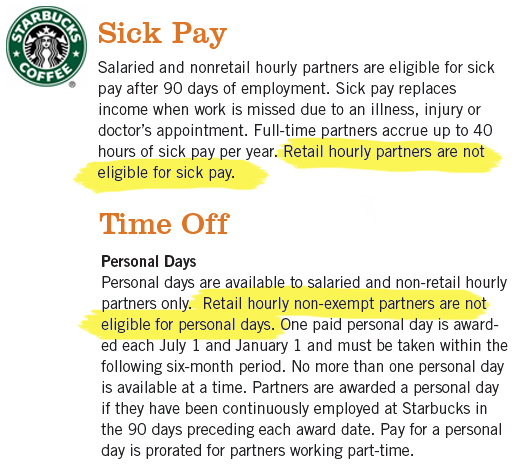 Supporters of the paid sick days proposal under consideration in the Seattle City Council chose Starbucks because Starbucks offers paid sick days to their corporate employees and managers, but not to baristas and cashiers in their stores – the people actually handling food and drinks. Starbucks recognizes that time away from work is essential to our partners’ health and productivity, whether it’s time spent with family or friends, or contributing to our communities or favorite causes. Time away from work is essential to worker health and productivity – especially when it’s spent recovering from an illness or seeking preventive care. But as their sick day policies show, Starbucks’ stated values seem to only apply to corporate staff and managers – and not to store employees. Starbucks employees working in Seattle coffee shops shouldn’t have to choose between working sick and and losing pay. After all, Starbucks offers paid sick days to their baristas in Chile, China, Australia, San Francisco, and elsewhere across the globe – so why not Seattle? This entry was posted in Business productivity, Healthy workers, In the news, Paid sick days and tagged barista, coffee, food safety, howard schultz, Paid sick days, paid sick leave, seattle, starbucks. Bookmark the permalink.